Have you been having issues with lumbar health and overall comfort in your day to day life? If so, the Ironman Gravity 1000 Inversion Table will be highly attractive and It is one of the best inversion tables for back pain. It is designed to increase your blood circulation and to reduce fatigue and back stress. Additionally, it provides many great health benefits to other aspects of your skeletal and circulatory system. For a reasonable investment, you can begin stretching your body out in just the right way, allowing you to revolutionize your fitness goals and your overall strength. Few inversion table models have as solid of an inversion system as the Ironman Gravity 1000 Inversion Table. It’s smooth inversion and 3 different preset inversion settings allow you get started immediately, even if you have no experience using an inversion table. Due to a lack of excessive features or gimmicky design choices, the best inversion table is easy to use. Finally, the extra-long vinyl covered rails will give you the ability to easily adjust yourself and maneuver while using the product. Unfortunately, many inversion tables limit their audience when designing the product. To keep the Ironman Gravity 1000 Inversion Table usable by most consumers, the manufacturers have made it with a variety of body types in mind. First, it can handle up to 300 pounds, making it perfect for those who have difficulty finding good equipment for plus sized people. Additionally, it is extremely tall, and can reach a maximum height of 6’ 6’’. If you are sharing the equipment with friends or family, or if you run a gym you will also love the product’s height-adjustable frame. The Ironman Gravity 1000 Inversion Table is built to keep the inversion table from experiencing issues during operation that could potentially harm the user. With non-skid rubber floor stabilizers, you will never have to worry about slipping and falling when in a vulnerable inverted position. Additionally, this will keep the inversion table from scooting across the floor and causing unsightly scratches. The reduced back stress and decreased gravity affects the product offers also keep your body safe from any stressful stretches. 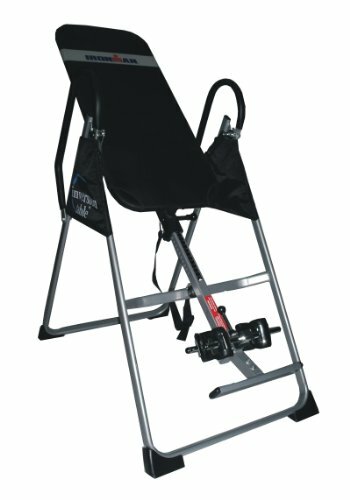 If you hate purchasing products that skimp on materials, you will be pleased with the construction of the Ironman Gravity 1000 Inversion Table. Compared to other similarly priced inversion tables. This product has high-quality materials that make it much more effective at what it does. Its frame is made from a durable tubular steel that helps to keep you locked in a safe and beneficial position during operation. Additionally, every inch of the product is given a powder-coated finish to keep it beautiful in its design. Keeps stress off of your body, and is meant to reduce not only back stress but the negative effects of gravity on your health. The Ironman Gravity 1000 Inversion Table is an award-winning product, so you know you are getting something special. Almost anyone can use the Ironman Gravity 1000 Inversion Table, due to its 300-pound weight capacity. Although it is foldable, the Ironman Gravity 1000 Inversion Table can still prove somewhat frustrating to take down and store. Not only is taking the chair down frustrating but putting the product together after purchasing it has been known to be quite the ordeal. Q1. How comfortable are the ankle locks on the Ironman Gravity 1000 Inversion Table? A1. Unfortunately, there have been complaints about the Ironman Gravity 1000 Inversion Table’s ankle locks. While this does not knock the product too far down in its quality, it can make it somewhat frustrating to use for long periods of time. Q2. Is the Ironman Gravity 1000 Inversion Table easy to learn how to use? A2. Although users have reported frustration setting up the Ironman Gravity 1000 Inversion Table, few have had anything but pleasantries regarding the actual performance of the product. Q3. What is the maximum inversion angle of the Ironman Gravity 1000 Inversion Table? A3. The Ironman Gravity 1000 Inversion Table can invert to a full 90 degrees. Perfectly engineered to increase speed, stamina, endurance, strength, and circulation, the Ironman Gravity 1000 Inversion Table is a great investment for fitness enthusiasts or those that need to give their body a much-needed tune-up. It is relatively easy to use, affordable, best inversion table for the money and is made from top-notch materials. Additionally, it is an award-winning product that can help you feel assured about your investment. Overall, this is the product for anyone who simply wants to feel better during their fitness regimens, and in their daily life.